and from little league to high school, from college to the pros. Purchase a new Bat and Save the shipping just $10.00 and size any solid color listed. not in the stands. Better harder hits more performance no need for batting gloves feel the breeze as you swing your bat. Lizard Skin Bat tape has hundreds of tiny holes that feel like a small cushion under your hand. They allow gripping pores which allow you to hold the bat with a much lighter grip and attain the same hold of your bat. The baseball hitting advice applies, "Loose muscles are fast muscles". In crease your bat speed and lower the sting on cold days. Just try it you'll believe it. Since 1993 Lizard Skins has created products to meet the needs and wants of sports enthusiasts around the world. 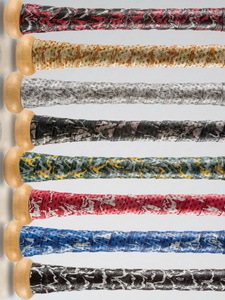 With a wide variety of hi-performance products including the new unique DSP Bat Wrap, Lizard Skins always aims to help you maximize your performance. Looking to increase bat speed with out the worry of slinging your bat into the stands? Athletic Flat 5/16 Shoe Lace is a basic slim and flat lace and is compatible with athletic and casual shoes. The Athletic Flat Shoe Lace is available in a variety of popular colors and comes in 54 inches in length. Athletic Round 3/16" Shoelaces The Round Shoe Lace is one of our most popular styles. Also 54 In. This handy Deluxe Pine Tar Pro makes it easy to apply Pine Tar liquid to any bat with ease, and without the mess. It also comes with its own attached carrying case for the bottle of Pine Tar and a clip so that it can be attached to almost anything. A 4 oz. bottle of Pine Tar is included.